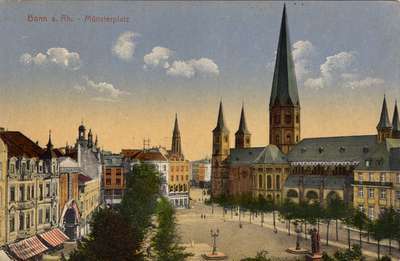 A postcard sent by James Gallaher from Germany one month after the end of World War I. A statue of Ludwig van Beethoven was unveiled in the plaza in 1845 -- he had been born in Bonn in 1770. "I went through here at 12 midnight on 13th again on 14th it is a lovely town. Part of it is in on either side of Rhein.